The TS-E thermostatic valve is suitable for one- or two-pipe heating systems, and is available in straight, angled and reverse angled versions. Standard models feature a threaded socket, are nickel plated and have a white screw cap. 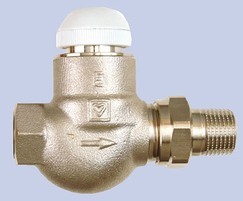 Universal models feature a special socket for threaded pipe and a compression union. An O-ring is used as a spindle seal. It is located in a brass chamber, which can be changed during operation. The O-ring keeps maintenance requirements to a minimum and allows for smooth valve operation over a long period of time.